The concept is they send you 100% cotton tampons in your chosen variety of light, regular and super. I assumed that, because they’re focused on the EVILS of what may be lurking in your tampons, that they wouldn’t choose plastic applicators. I was mistaken. They promise that the plastic is BPA-free, but they don’t mention much more about it. Their box labeling includes: “Ingredients: cotton, plastic”. Uh… “plastic” is a pretty flexible term in my mind. Cardboard isn’t necessarily any better, but I just found it a strange choice. Too, for me, was the after dinner mints wrapping. Why not paper? I guess I assumed because of the focus on cotton, that this would be an eco-friendly company. I feel like it’s not. The box is a really nice paperboard (no glossy coating) which is better for recycling, but I just don’t feel good about this brand in relation to their eco-ness. Which, to be fair, they don’t tout. It was just my assumption. The tampons themselves are the mini, compact kind. The cotton is very dense and with a lot of ribbing on the sides to help it expand. The string is a thin wisp of knotted thread. For me, the tampon was actually too dense. I inserted a super tampon on a very heavy flow day. When I removed it, it was apparent that the tampon acted more like a cork than an absorber. The end was slightly bloody, but when I pulled it out, GOOOSH. I dropped one in water and it expanded really slowly, but gave me the definite impression of a very solid puck of cotton. Not for me. I just don’t like compact tampons versus “regular” ones. I prefer longer tampons. It just feels like more protection from leaks to me. I also like a sturdy string and Lola didn’t have it. And I like my paper-wrapped tampons with cardboard applicators, to hell with what’s in the tampons themselves. 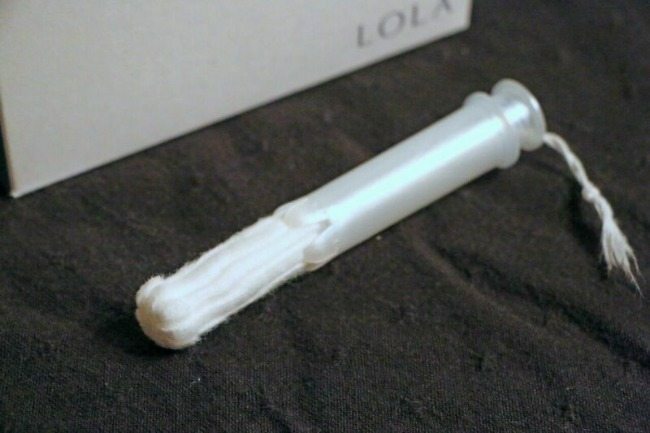 I agree with Lola that we do need better regulation of tampons, but just because they say their cotton is 100% cotton, that doesn’t mean that their tampons are pure and free of taint. They say “100% natural cotton” with “no chemicals, synthetics, or dyes”. But this doesn’t look like raw cotton to me. It’s been processed and surely bleached? I just feel like Lola should clarify just what “natural” means to them. This subscription is not for me. I like the concept a great deal, but the price is out of my reach and their product just isn’t suited to my personal use. I wish they had other options, and who knows, they might add them. But for now, it’s a pass from me. I only got the regular and super, so who knows, their light tampons may be AWESOME. But it’s just all-around not fer me!